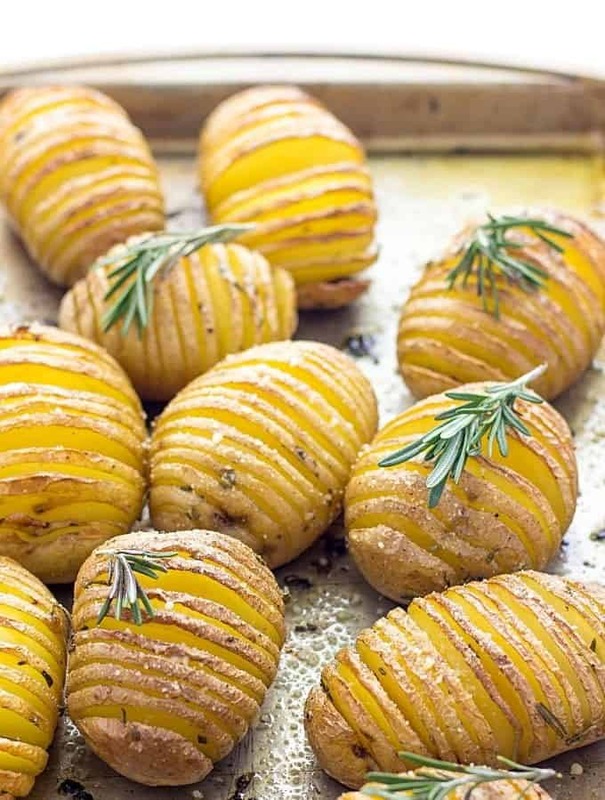 These Best Hasselback potatoes are the most beautiful potato dish you’ll ever make. Cut into a funky accordion shape, this crispy and delicious side dish is sure to delight your family and friends. Not to brag, but this is seriously one of those recipes that you should go and make right now. Or at least make it for Sunday family dinner. Because first of all – you’ll get an amazing potato side dish, that is by the way quite healthy. Potatoes come out tender on the inside and crispy on the outside. On top of that, they are cooked in the garlic and rosemary infused olive oil and sprinkled with a touch of Parmesan cheese for an extra crispiness. I hope you’re already hungry. Second of all – these potatoes are stinking cute and your family and friends will be delighted by its accordion shape. And finally – these best Hasselback potatoes actually easy to make and the only equipment you need is a pair of chopsticks or two wooden spoons and a knife. Originated from Sweden in 1953 and called Hasselbackspotatis, these are the type of baked potato, where potatoes are thinly sliced halfway into a fancy accordion shape. Simple but so impressive. Thanks to its unusual shape, this potato side dish is perfect for holidays. Think Thanksgiving, Christmas or any other holiday when you’re expecting guests and want to do something special for them. Whenever I think of a side dish to impress, I immediately think Zucchini And Potato Gratin (if you haven’t had a chance to try it yet, do this asap!) 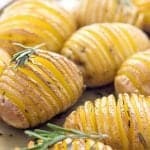 and Hasselback Baked Potatoes. If you know how to make these two recipes, you’ll be the master chef in the eyes of your guests. This time, I went easy on possible additives as I wanted to keep my recipe simpler and healthier. I’m giving you a basic yet self sufficient recipe. But if you feel like you want to get some extra calories in (there’s nothing wrong with an occasional comfort food), go ahead and add some bacon, cheddar cheese and/or drizzle with some dressing. 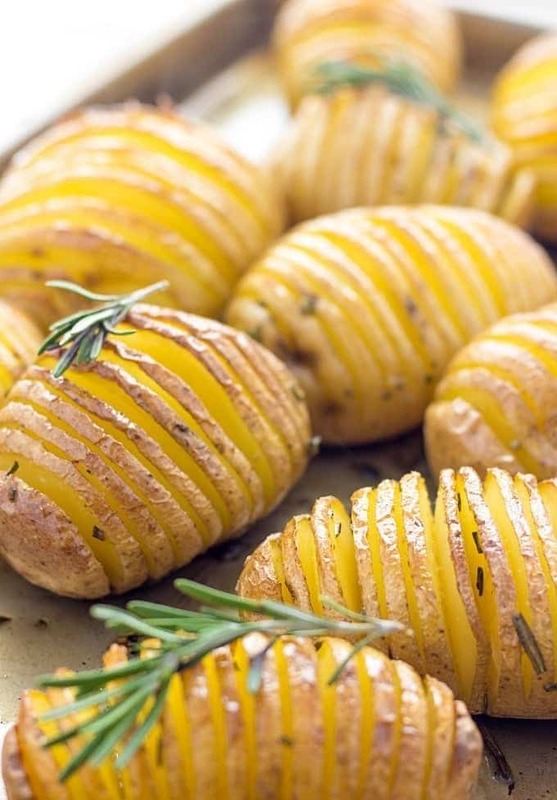 These Easy Hasselback Potatoes will never disappoint. Goat Cheese And Prosciutto Crustless Quiche. 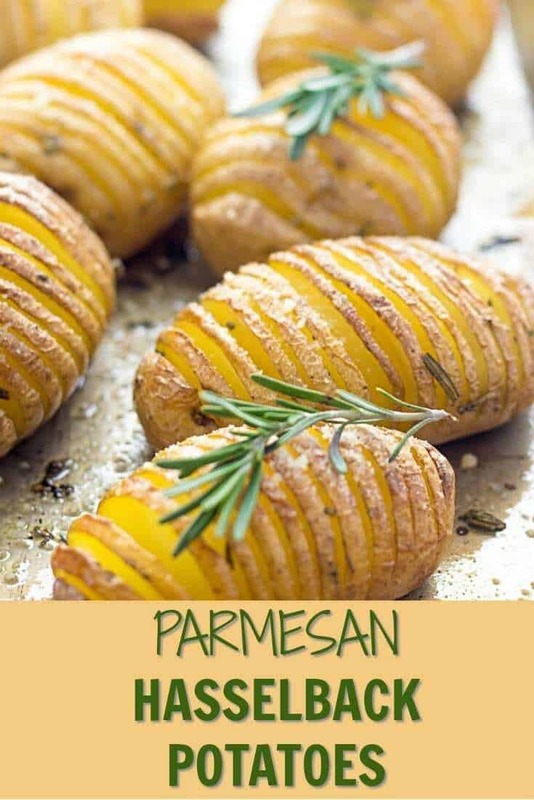 These Best Hasselback Poatoes are so easy to make. They are beautiful, healthy and worth making again and again. In a small sauce pan heat the olive oil. Add garlic and remove from the heat. Let garlic infuse the olive oil for 15 minutes. Strain the oil and discard the garlic. Add rosemary, smoked paprika, salt and pepper. Place the potato between the handles of 2 wooden spoons and make slices, about 1/8 inch thick stopping the knife when it reaches the spoon and making sure not to cut all the way through. Place sliced potatoes on a large baking tray. Generously brush each potato with garlic infused olive oil. Bake for 30 minutes. Remove from the oven and brush with olive oil once again. Bake for another 30 minutes or until potatoes are soft. (Insert a sharp knife in the thickest part of potato and knife should go through without resistance). Let me know if you’ve tried these Swedish style potatoes before and what do you think? If you make my Hasselback Baked Potatoes, snap a picture and post it on Instagram with a hashtag #lavenderandmacarons. Thank you Catherine! This is one of my favorite dishes too! These look so tasty! I love your tip of putting the potato between wooden spoons – when I’ve tried to make these I accidentally cut right through the potato! Thanks Danielle! I’m glad you found my post useful! They look so pretty! I have never actually made hasselback potatoes. I’ll have to try your recipe. I hope you’ll love it. It’s so easy to make. This is my favourite way to eat potatoes. They just get so lovely and crispy. thanks Danielle! This is one of my favorite potato recipes too. Such beautiful presentation. I am intrigued. I can see my family loving these! How lovely! It looks very appetizing.